I am an artist, deep in the center of my soul. I have many roles in this life, but I think perhaps more than any other, artwork is at the center of it. The medium may vary–hides and bones, words on the screen, ingredients in the kitchen, a carefully considered response to a counseling client’s thoughts–but at the heart of it all is a deep need for creativity and expression, arranging things just right. Most of my visual artwork for the past fifteen years has been with the dead critters, but I do like to branch out–I don’t want to be a one-trick pony, after all. One of my passions is art made from secondhand materials; this does describe some of my hides and bones, but I also want to reclaim some less biodegradable things as well. So I do like having a bunch of found objects to work with, things salvaged from thrift stores and free piles on the curb and so forth. Click on this to get a bigger version of the image. It’s called The Natural Order of Things, and it’s almost entirely made of recycled materials. The 6″ x 8″ canvas panel it’s based on was bought from a yard sale. The book clippings were from an old-but-not-rare, quite outdated textbook on animal anatomy that I bartered for. The foam cutouts came from a Goodwill on the Oregon coast. All I had to add was a few brushfuls of Mod Podge and a bit of cellophane tape. It looks simple enough at first glance–brightly colored bits of foam on a stark black and white background. 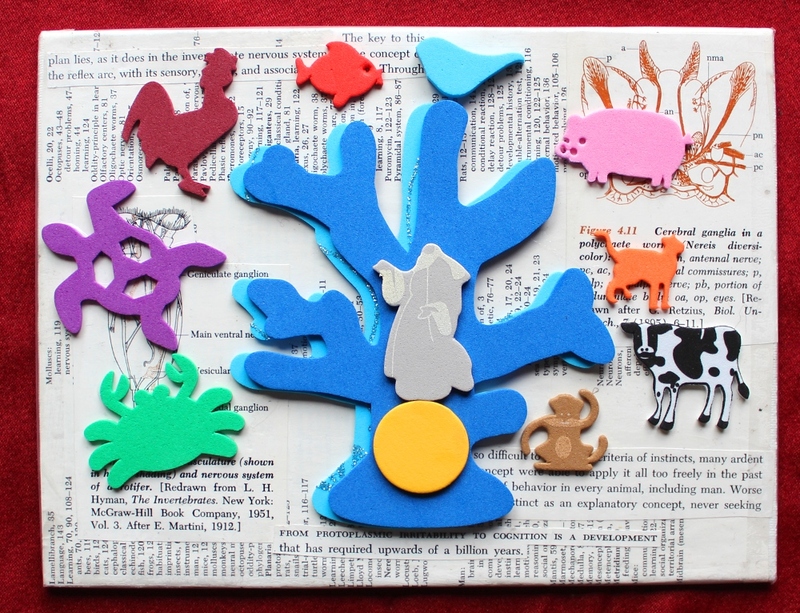 The tree of life branches out from the center, with an array of animals taking up their places as they should. But upon closer inspection, the animals are in no real order; rather than closely-related families being situated nearer each other, a fish is next to a bird, which sits just above a pig, and so on. Moreover, there’s only one invertebrate, a crab in one corner. The representatives of the animal kingdom are largely biased toward mammals, especially those we feel are important. And at the center of it all is humanity, represented by a god-like figure (Yahweh? Zeus?) standing on the sun. Humans are removed from the tree of life, only to be relocated at its center–“Man shall have dominion over the earth”. As if to comment on the misinterpretation of evolutionary theory that says “Humans are evolved from monkeys!”, a tiny monkey occupies the smallest and lowest branch on the tree, decidedly separated from its Homo sapiens cousin. But what supports these animals and their tree? In the background the canvas is covered in pieces of pages from a textbook of biology. The foundation is the index, listing many animals in neat, alphabetical order–to include, along the bottom edge, “Man”. Over this are laid diagrams of the nervous systems of a rotifer and a polychaete worm, neither of which are particularly well-known animals, but which illustrate the type of simpler nervous systems from which those of vertebrates evolved. Several quotes add to the mix–one about the basic plan of the nervous system in all animals, one about how humans have often misapplied “instinct” to anything any animal does ever, and one, legible in full: “From protoplasmic irritability to cognition is a development that has required upwards of a billion years”. We extol the virtues of a select few noble animals, while we stand on the spineless backs of countless humbler creatures. Despite claims of religions worldwide and throughout time, we did not spring forth fully formed from a head or a thigh or our partner’s rib bone. We are built on billions of years of tiny changes. The cartoonish, artificial figures in their disarray, arranged inaccurately around humanity as the reason for their existence, represent the biases we hold toward the natural world. We value what most closely resembles us–vertebrates, and especially our fellow mammals–and most of all, those who directly serve us. The man-as-god in the center is our tendency to elevate ourselves above all else, much to the detriment of all involved, humans included. One can only stand on the sun for so long before getting burned. In contrast, the neatly ordered, realistically rendered invertebrates speak of the care that has been taken to excise the secrets of evolution and other natural processes, sifting out the detritus of superstition and speculation. This brightly-colored Eden can dance all it wants, but those who wrote the stories of paradise could only do so after a parade of many generations of supposedly “lesser” beings. But it’s also because of these pioneering beings that came before us, unknowingly contributing to the shift and change of genes and their expressions, that we can also have art. We can have religion, including beliefs that don’t match with evolution in any literal way but have their own beauty nonetheless. It’s because of them that we’re here to debate our origins today, to take strong opinions and fence with them, or to simply decide the argument’s not worth it and go play video games instead. I am grateful to them for this opportunity, and I dedicate this piece to all my ancestors, all the way back to the beginning of life. Note: This is my June offering for the Animist Blog Carnival, with “Science” as the theme; please note that the information about it has changed locations. When I was young, all I wanted to be was a veterinarian so I could help animals. As I got older, I found out that being a vet wasn’t just about making animals better, but also tough things like euthanasia, and I wasn’t sure how I felt about that. In high school I got a partial scholarship to a school a few hours away from my hometown and thought I’d major in business management, since I enjoyed selling tchotchkes at a local antique store and had always been one of the most productive sellers of school popcorn and Girl Scout cookies. But then a trip to a wolf sanctuary convinced me that I wanted to get back to working with animals, and so I switched to biology and enrolled at the university in my home town. My hopes were utterly dashed when I barely scraped through remedial algebra, and realized there was no way I was going to make it through the more advanced math and math-heavy science classes the program required. So I switched to English, and figured I’d just write about wolves (which I did, among other things). I never stopped regretting, just a little bit, not being able to enter into the STEM (science, technology, engineering and math) fields. Oh, sure, my Master’s is in counseling psychology and I passed my research methods and statistics classes alright, but my background even there is less about research and more about the person to person interactions of counseling itself. I’m not a scientist. At best, I’m an amateur naturalist. I read a ton about my bioregion, from the geology to the fauna and flora to the weather patterns and more. I apply that knowledge to my experiences outdoors, and thereby have a deeper understanding of what it is that I’m seeing, hearing, touching, and otherwise sensing around me, and my relationship to it. But I’m barred from doing any research myself unless I struggle past algebra and into calculus, fight my way through organic chemistry and how to balance equations, and other things that are apparently necessary to advance past where I am now professionally. Mind you, I don’t wish that I was only a scientist of some sort–maybe a marine biologist, or a paleontologist (the five year old me would have loved that idea–and I still do today! )–and nothing more. I’m quite happy having a variety of professions and trainings. I love that I can draw on ecopsychology, a beautiful blend of psychology, natural history and art in my counseling practice. But I admit that I envy people who get to go to field work, who get to find out about neat new discoveries before everyone else does, who get to do research into animal behavior and botany and weather patterns. The most I can do is consume their findings from this end. So why does it matter? The longer I’ve walked this path that I’ve detailed in this blog for so many years, the more I want to know about this world we share. I am full of awe and wonder at its intricate workings, the sheer joy of evolution and physics and the other processes by which it works. I’ve felt levels of spiritual connection more profound than just about anything I experienced when my focus was more on symbols and abstractions, where I still felt somehow separate from what it was that I honored. And so where some people may wish to dive more deeply into ancient texts or devote themselves more completely to their gods, I want to immerse myself in this unbelievable world I’ve had the good fortune to be a part of, even if only for a tiny blip in its long lifespan. I’m already doing everything I can to be a more active participant in it–and in its preservation. Perhaps, in a way, I see those immersed in the sciences as a sort of clergy, and fieldwork as ritual, and research as the study and interpretation of sacred doctrines. Not as infallible holy writ, mind you, or “scientism”, but as one more way to know this world in all its parts. But then I realize that perhaps it’s not such a bad thing to be a generalist, an amateur naturalist who can more easily draw from the layperson’s end of all the sciences. I don’t have to adhere only to astrophysics, or molecular biology, as my bailiwick. While I don’t have the competency of a trained specialist, I also don’t have to defend my stances in my specialty in the same way. In fact, I’m free to browse at various theoretical fields–a little zoology here, a dash of meteorology here–not as a way to try and “be right”, but simply to augment my understanding of the world and my place in it. I still rely on specialists to help me ward off bad information and interpret what’s good, but I’m not married (figuratively) to any of them. So while I still feel some envy toward the people who get to work at the Oregon and Monterey Bay aquariums, or painstakingly scrape and scuff rock away from ancient fossilized bones, I know I’m in the best place I can be. If someday I figure out that math stuff I may take a stab at even more intense training, but until then, I’ll happily curl up with my books and my documentaries and my layperson’s understanding, soaking it up like a sponge. First, a quick hello from internet-land! I spent this past weekend down in Long Beach and surrounding areas for Ghostwriters Unite! ; I was at the conference to help moderate panels and lend my small press experience to the general milieu, though I also got a lot of schmoozing in as well. I learned a lot about ghostwriting, to include that it’s much more complex a profession than one might think, and I met all sorts of fabulous people from a variety of backgrounds, and I wish we’d had more time together. A huge thank you to Tyger Ward for getting me connected to the conference in the first place! I ended up making a long weekend of it since I was down there on my own anyway, and on my off time I explored the Long Beach marina, went up to the La Brea Tar Pits, and even stomped around Griffith Park for a while, where I saw my first rattlesnake in the wild (probably a southern Pacific rattlesnake) and walked by the cages for the old Los Angeles zoo. All in all, it was a most excellent trip, and I plan to do it again. Yes. Teach your children that through the internet they can access more information about the world than ever, from places they may never see for themselves, from people they might never have known existed, about topics they never even knew existed. And then teach them that while this knowledge is well and good and valuable, it’s not a replacement for also going out in the world and experiencing it, and being out in it. Let these things complement each other. Let the internet be a way to fill in the blanks about the new type of bird you encountered while you were breathing in the fresh air out on a hike, moving your muscles and negotiating rocky terrain. Let the words of others who have recorded their experiences and shared them via technology enhance your understanding of what you see with your eyes, or hear with your ears, or touch with your fingers. Let the internet spread the word that a particular species of bird is highly endangered and should not be harmed, even for food, and let on the ground action and protection follow it up. 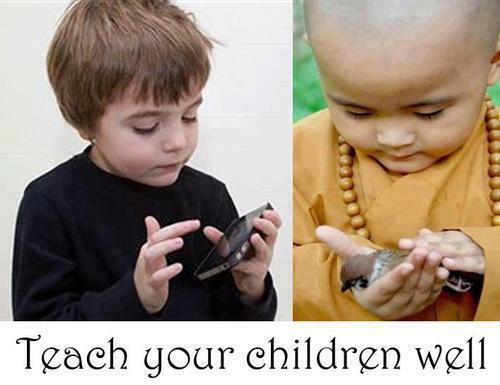 Both of these pictures are children learning well. Let them teach each other, too. Of course, this also brings up the issue that there are many, many children (and adults) who don’t have access to the internet, and some whose access is restricted either through government censorship, or limited computer access, or illiteracy, or other barriers. All the internet connectivity in the world won’t help if you can’t get to it, or understand what’s there. It also doesn’t bring into account that more and more children in the US and elsewhere are being denied access to wild, open spaces in which they can roam and explore without helicopter parents hovering over their every move. By the time they’re old enough to make their own decisions on where they can go, the window for early fascination with nature has long since closed, and many simply don’t care. Unfortunately, tech and nature are often set against each other in an either/or dichotomy. As we create increasingly complex technologies, they may distract us from the world around us, especially the outside world. Those who wish to preserve nature and the human relationship with it may sometimes claim moral superiority because they don’t have a tablet PC or smart phone. I’ve written before about how nature vs. technology is a false dichotomy, and I still hold with that. Both of these influences contributed invaluably to who I am today, from the antibiotics that saved my life a few years ago and the computer I use to communicate with you folks via this blog, to the small, sacred places that raised me and all the trails in the Columbia River Gorge I’ve explored as an adult. Both unfettered nature and technology have their good and bad sides from a human bias. Unfortunately, we’ve lost our respect for both of them; we take and take of the good while pretending we’ve completely overcome the bad. The Black Plague may be a distant memory, but over a million people die from malaria worldwide every year. Cars get us from place to place with independence and speed, but oil spills are just one of the many costs the petroleum industry likes to sweep under the rug. Still, if people are able to live happier, healthier, longer lives, that can’t be all bad–especially if we can do so in sustainable manners that also leave plenty of room for all of our nonhuman neighbors on the planet. We won’t learn to respect both sides if we demonize one or the other. This is why I am neither a Luddite nor a technophile, and why I enjoyed both the museum at the Tar Pits and the trails at Griffith Park. Everyone’s personal balance may be different, but I firmly believe that as a species if we are to survive and thrive we must respect both the uncontrolled, wild nature we came from and the technology that we tool-using apes have created.